I'm not sure I've mentioned here that one of two things I never try to get involved in are discussions about abortion and/ or Israel. I've never understood how abortion came to be the number one issue for many people in regards politics. I've seen many times, when plugging a candidate, when the first question the other person asks is where the candidate stands on abortion. Ugh! Along that same line, someone wrote a letter to the Times- Standard complaining about the lack of pro- life expression at the recent anti- Trump march in Eureka. 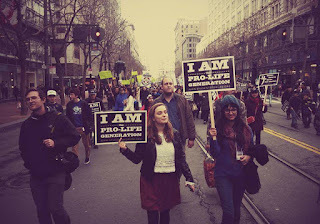 I had to point out there was a pro- life presence at the march, albeit a small one. 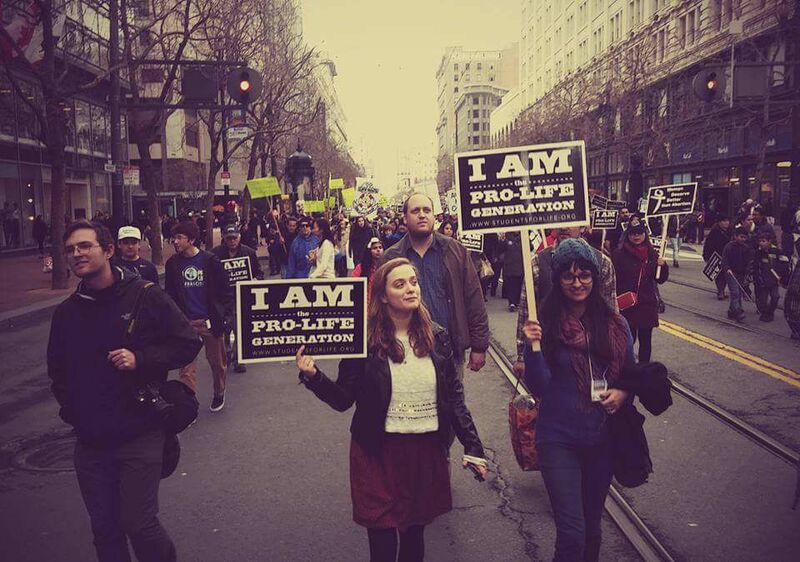 Below is a photo of my niece (on the left), Joelle Shively and a friend carrying pro- life signs at the march. No surprise there as she has Catholic blood running through her veins, but I still don't understand why it's such a big issue with everyone else. Years ago, while running a Libertarian Party table at a local gun show, I struck up an acquaintance with a sweet young girl from Redway. I think her name was Dianne, but am not sure anymore. We seemed to get along famously the first day, talking non- stop about politics and the time flew by. When I was driving home that day, for some reason abortion entered my mind, even though we hadn't discussed it. I wondered to myself why abortion is such a big deal to so many. After all, it's not like everyone is going out and getting abortions. The next morning I made the mistake of bringing that up to Dianne and she sure told me! I told her, "I was thinking last night, wondering why abortion is such a big deal. It's not like everybody is going out and getting abortions." She wheeled in her chair, swung around staring at me and said something like "If you needed an abortion and couldn't get one....". She was pissed. I backed off and dropped it. We didn't speak much most of that morning. Later in the day she seemed to come out of it and we were back to being best buddies. Lesson learned: I'll never bring that subject up again....except maybe here. Was your niece counter-protesting at the Women's March, or saying she hates Trump's misogyny in all its forms except with respect to abortion? I would think this issue is fairly clear cut from a Libertarian viewpoint -- while you are free to not get an abortion or use birth control you are should never be able to force the imposition of a religious belief on another who disagrees with it. And let us be clear, the anti-abortion movement is not "Pro-Life" unless they are also anti-death penalty and anti-war. "Was your niece counter-protesting at the Women's March"
I suspect just getting the message she wanted out where a lot of people were present. I had no idea she was going to do that and never spoke with her about it. I believe that should be "well written"? As a libertarian Fred, figured you'd believe in "do as you desire as long as you pay for it 100%". Good for your niece & her friend. More would have joined her if the local news would have mentioned it, but that would go against the agenda, as we all know. I can't understand how it ever got on the political ballots. It almost makes me want to fight for the right to choose to continue shooting at my target even if somebody stands in the way. It's MY target dammit. But I value the Constitution & life itself, so I won't. The pro-abortion people are caught up in a jing-a-ling, named pro-choice. Killing others is not pro-choice, it is pro-murder. Pro-choice is having the freedom to screw around all you want. That's your body, your choices. But when another person is created from that choice, consequences of responsibilty take over. Killing another person is not a choice. Adoption or parenting, are.